On the first day of Christmas, my true love gave to me…a man pooing in the country. Yep, you read right. 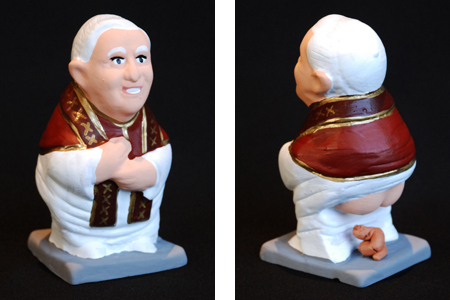 I’m going to start this on a vulgar note – but in all honesty, if you live in Catalonia, you can’t avoid the Caganer. At the Christmas market outside the cathedral in Barcelona, you can buy figurines for your nativity: rows upon rows of them. Here it’s not just limited to the stable – you have surrounding fields, streams, other houses, the hills where the shepherds live, and many more settings to let your figures stand. Looking at all these pretty characters, I was suddenly struck dumb. Why was there a boy with his trousers down, with a lump of excrement below his naked bottom? The English bashfulness arose – mention anything to do with our nether regions, and we suddenly start being incredibly interested in the floor, and stuttering a large amount. I was astounded. Surely it was a joke? But no, there were stalls upon stalls, all containing the same little character – and not just in the same style. Celebrities get the same treatment, and in the space of one shelf, I noted Freddie Mercury, Messi, good old Queen Elizabeth II, and, if you can believe it, the Pope. Surely an area so predominantly Catholic can’t be happy to have a figurine of the Pope pooing all over their Christmas scene? Let me explain about this particular tradition. Sadly, people can’t agree as to why it really came about. It’s been a part of nativity scenes since the 17th century and is common not only in Catalonia, but in Murcia, and other parts of Europe too – although it is more prevalent here. Several reasons have been given for the origins of the Caganer, although, none seem to hold much weight. To be honest, I’m of the belief it came about as a little joke, children liked it, and it stuck. Some say that he is fertilizing the earth, some say it represents that everyone is equal (everybody defecates, a new take on that R.E.M classic), and others, that it makes the Christmas story more natural. Who knows? The Catalan people certainly don’t, and just accept the fact it’s a part of Christmas. No, really. It's the Pope. On the second day of Christmas, my true love gave to me…different fish aplenty. What do the Spanish eat for Christmas dinner? No Yorkshire puddings here, or pigs in blankets, bread sauce, Christmas pudding, or sprouts (good). Traditionally, the main meal is on ‘la Nochebuena’ – Christmas Eve, to us. What you get dished up will depend on the region, but it’s quite common to have fish as your centrepiece, and shellfish too. Fish is eaten more frequently over here, and the Christmas meal reflects this. Meat can be had, too, but it’s much rarer to have a bird (unless you’re in Andalusia), like we would. It’s more likely to be lamb, or suckling pig. Again, though, this varies on the location. Here, in Catalonia, you’re actually less likely to find a meat or fish as a whole. Catalan people cook a stew, which is typical fodder anyway throughout the year, but to make it more special, they add much more meat and vegetables: a whole and hearty affair. For starters, you’d be served up pasta: ‘galets’, specially named, as they take on the shape of a snail. Christmas dinner is also on the 25th, too (they do like to do everything the contrary to Spain…), and will be at lunchtime – most likely around 3pm, as 12pm lunches don’t exist here. On the third day of Christmas, my true love gave to me…April fool’s day. Eh? April Fool’s Day? Well, no, not really, I lied a bit on that title, but it’s the closest festival we have to ‘Los Santos Inocentes’ feast, which is on the 28th December. It lasts all day, and, much like the papers and media in England, tricks are played on the television news programmes, or in the magazines. The family I stay with told me people put signs on people’s backs (not ‘kick me’ – though I feel like this might be an amusing one to introduce. The children would certainly enjoy being unruly, as they always are). On the fourth day of Christmas, my true love gave to me…a ticket for the lottery. On the fifth day of Christmas, my true love gave to me…some tasty treats. We watched a video in school of an ‘English Christmas’ to educate the children on our cultural differences (this just means Jack, the haughty little English boy, is back with a vengeance, writing cards to grandma until he’s blue in the face). Sally, Jack, and their mum – in true English tradition, dad’s not anywhere to be seen – made mince pies, which were met with cries of revulsion from the children, calling ‘how disgusting!’ I’ve really missed mince pies this year, accompanied with a vat of brandy butter, but I have managed to gain about five pounds in weight from one of the treats over here alone: the turrón. These are sweet blocks of various things that are absolutely delicious: they can be made like nougat, chewy, with almonds, or chocolate covered truffle, or hard chocolate with crunchy biscuits in, or maybe even bits of marzipan, white, dark, milk, you name it, turrón has it. Basically it just seems to be a sweet brick of calories. Lots of biscuits are eaten, too, and marzipan chunks. Panettone is common, too, and almonds covered in a sweet coating. I feel like I gain weight as soon as I walk in the supermarket, eyes wide at all the rows upon rows of brightly coloured wrappers, winking at me temptingly. 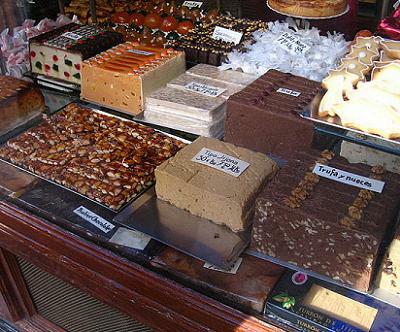 Various turrón delights can be seen in most Forn de Pan. On the sixth day of Christmas, my true love gave to me…some carols sung terribly. The children at school have been taking part in the usual Christmas concert, which is a lovely reminder of Christmas for me, nostalgically taking me back to when it was exciting, magical, and you would take every opportunity to show off on stage as much as you could (I was usually given the part of the narrator, which no child really wants, as whilst it means you speak a lot, you can’t exactly ‘get into character’, and nobody comments on how fantastic you were, just that you can ‘speak clearly’). Here they’re split into three groups for the concerts; 1é and 2n together, 3r and 4é, and then lastly 5é and 6é form a concert group. The first group is the little ones, and they learn a couple of carols and sing sweetly for all the parents, who all comment on how cute they are, even if they get it wrong. The next group is where it starts getting a little more complicated – they play some songs on the recorder, too, and tell a little about the story of the Nativity, coming to the front of stage and taking a line each, in rapid Catalan that even the teachers can’t understand. The last group get the more difficult songs, and also play the recorder, too. The children have not only been learning some Catalan Christmas carols (for which the award of ‘most boring carols on the planet’ goes to: I know the Spanish have much more exciting songs, but they just weren’t picked. All the teachers have been commenting on how ‘tristé’ the songs sound – sad), but they’ve been given the challenge of singing English ones too. Which means this year in the corridors, I’ve been serenaded with renditions of ‘Santa Claooz is comiiiing to town’, and ‘War eez over’ (which they think, wrongly, was made famous by Celine Dion). On the seventh day of Christmas, my true love gave to me…a chunk of wood from a tree. This is just one version of the song, and it translates roughly to mean this: ‘Poo log, poo turróns, hazelnuts, and cottage cheese. If you don’t poo well, I’ll hit you with a stick, poo log!’ Whilst the tradition may seem a little alien to a nation such as ours, where faecal matter is best left not discussed, it actually becomes quite endearing when you see how much the children believe in the Caga Tió. Recently, he’s gained a little face on the front of the log, and two sticks pointing out as legs, so he stands up a little, and looks quite sweet with a little hat on his ‘head’. The children in the nursery part of the school have a Tió in their classroom, and before they go up for their morning break, they leave him biscuits, fruit, or cake to munch on. When we came down from break we were met with screams of delight from the children, who raced up to the Tió when they saw the biscuits were reduced to a mess of crumbs. They were all so excited that Tió had eaten the food they’d left for him, and they truly do believe in him the same way English little ones believe in the magic of Santa. On the eighth day of Christmas, my true love gave to me…three kings a’ travelling. The main difference between Spain and England in the sense of Christmas is that the arrival of the Three Kings is much more celebrated – so much more so, that the 6th of January is the day more children are likely to look forward to than the coming of Santa, who is a relatively Americanised introduction to the country. 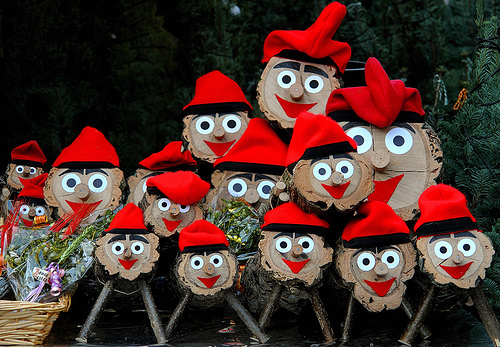 It’s lucky for these children to have been born in Catalonia, where they have both the Tió, and Los Reyes Magos (The Three Kings), to provide them with gifts. 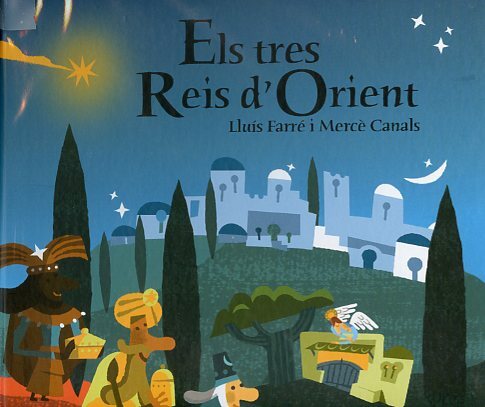 Early in December, the big toy shops started publishing magazines entitled ‘Els Tres Reis’ (Catalan equivalent for the Three Kings), where children could create a wishlist, tick the boxes of the toys they wanted, and just generally make mum and dad sweat with worry at the amount of stuff they wouldn’t be able to get. They don’t write to Santa here – they ask the Three Kings to bring them presents – although some lucky families celebrate both, and have introduced Santa into their normal Christmas. It’s traditional, I’m told, to either do one or the other, or perhaps have little presents on Christmas Day but wait until the 6th to have the big ones that they’ve all been waiting for. The Three Kings are just as exciting as Santa – when I drew Christmas cards with the kids, they were all relatively nonplussed by good old Papa Noel, but screamed at me to draw their three favourite monarchs, which didn’t really please me, as Santa is much easier to whack out than Melchior, Caspar and Balthazar. A more popular book than The Jolly Postman. On the ninth day of Christmas, my true love gave to me…less adverts on the telly. Christmas seems relatively low-key compared to our bombardment of adverts, lights, and imagery that we experience in England as soon as Hallowe’en is out the way. True, turrón and similar baked goods appeared on the shelves at the beginning of November, but it doesn’t seem quite the same. Having nice food is one thing, and is different to rows upon rows of tinsel, beads, and baubles that the supermarkets put in the first aisle for us to be greeted with as soon as we walk in. I haven’t seen a Christmas tree for sale once in a supermarket, or parked outside grocers as is our custom. Most families seem to have artificial trees, if they have them at all. Not everyone will. The Nativity scene is much more common to see. I’ve missed decorating the tree with carols blasting in the background – the closest I’ve come so far to Christmas preparation is making cards with the children I tutor, who are relatively inexperienced in the act, as Christmas cards are again, not a huge tradition over here. Spain is becoming influenced by other countries – largely America, who share most of our customs, which, I suppose in these days of mass media and interchangeable culture, is only natural, but I hope it doesn’t influence them so much that they begin to get bombarded by Christmas in the same way that we do. I doubt they regard the Coca-Cola advert as the beginning of the holiday season, as many of us jokingly do. 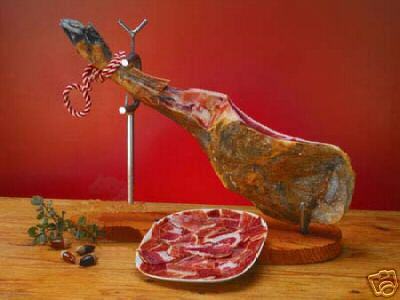 On the tenth day of Christmas, my true love gave to me…a leg of dried ham. On many a street in Spain, you may come across a shop that sells solely ham – you can gaze in the window and see it all laid out, both packaged, and in the form of the cured, whole leg. Cured meat and various versions of pork sausage are popular here, but it’s very expensive to buy the whole leg – the poor quality ones can be around the hundred euro mark (but they won’t have been cured for very long, and won’t have been a nice meat to begin with), but they can range up to three hundred, or higher. This therefore means many families will only eat this on special occasions, and Christmas happens to be one of those, of course. I’ve tried the ham, and I quite like it, but it’s very tough, often rather salty, and has all the fat still attached, which is something I can’t abide. In many shops, the special section laid apart for ‘Jamon Ibericó’ has some slices which solely seem to consist of a sliver of meat, with a great chunk of fat holding on to it. Quite what you put that on, I’m not sure, but I certainly wouldn’t want that on my Christmas toast. The proper way to eat your piggy. On the eleventh day of Christmas, my true love gave to me…an extra week off school. Being that the day of January the sixth is so celebrated here, with the Three Kings, Spanish children get to stay off school usually until around the 7th of January. This year they’re lucky, as the weekend falls straight after the 6th, and they won’t have to go back until the Monday after. When I told them that some years children in England can go back on the 2nd of January, they suddenly weren’t so jealous that we get to finish at 3.30pm. They’re incredulous that we don’t have the Kings – the very little ones can’t get their head around it, which I suppose is similar to telling a five year old that Chinese children don’t have Santa, because they believe he’s everywhere. So the children have longer to eat their chocolate, and enjoy their gifts, and not be dragged into town by their parents for the sales – which I hear are relatively low-key and less of a dreaded ritual over here. 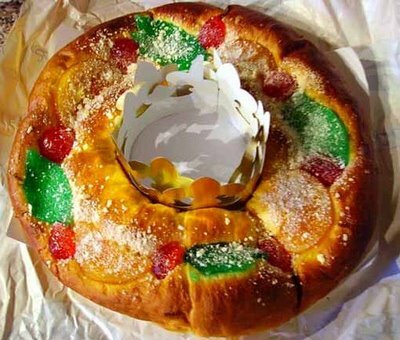 On the sixth, a special cake – Roscon de Reyes – is baked, in a large ring shape, with jellied fruits inside, and a little toy buried in the dough. Whoever is lucky enough to bite down on said toy may be made King or Queen for the day, which is the sole reason I want to try this particular cake: I quite fancy my luck bossing people around for twenty-four hours. Christmas truly is a time to gain weight in every country. 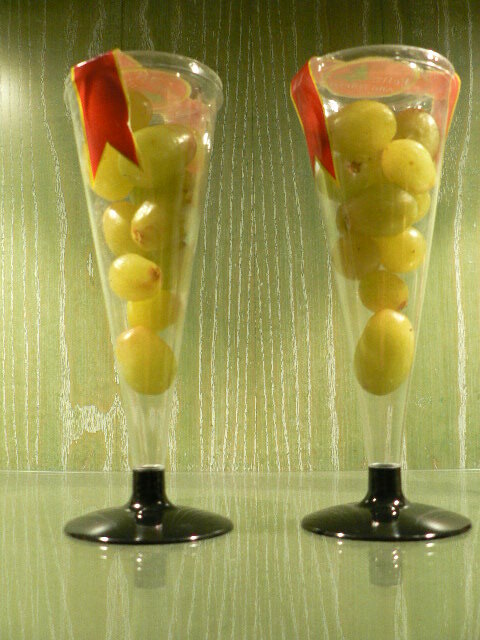 On the twelfth day of Christmas, my true love gave to me…twelve New Year grapes. Sadly, I won’t be in Spain over New Year, which means I won’t get to try out this fantastic party game (maybe I’ll have to bring it over with me). Grapes are peeled and prepared in advance for it, as the skin only impedes the participants. Each person, at midnight, is equipped with 12 grapes, and one must eat a grape for every strike of the clock. If you have finished the twelve grapes by the time the chimes are over, you will be bestowed with good luck for the coming year. I’m sure I’d be terrible at it, but I’m assured that you can become quite the expert at this game – I suppose, if you play it every year, you get to know your tricks of the trade. To me, it just sounds like a healthy version of ‘fluffy bunny’ (put marshmallows in your mouth, one by one, and repeat ‘fluffy bunny’ for each marshmallow added…a brilliant game should you ever want to put your children off marshmallows for life). Doce uvas, pre-peeled and ready to go. So, that’s Spain over the Christmas period – the only thing I’m a little put-out by is the fact that I won’t be able to experience the actual festivities: I’ve only taken part in the run-up. But it sounds like they’re prepared to have their usual jolly good time, whether I’m over there or not.